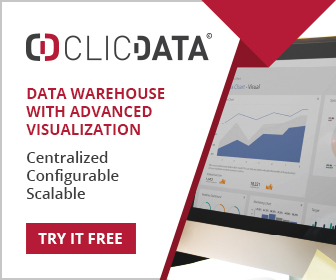 ClicData is a cloud based dashboard platform that successfully delivers an easy to use, drag and drop graphical interface, while providing the tools for power users to deliver high levels of sophistication. Business users are able to produce dashboards almost immediately, and as they become more familiar with the platform, so they can deliver dashboards that incorporate a wide range of charts and graphs, conditional output, pivot tables, calculations and many other features. It is ideal for smaller businesses, but has also found enthusiastic uptake in larger firms as they become familiar with its power and flexibility. The good news for very small businesses and single users is the free version of ClicData. This essentially supports CSV and Excel data, and data refresh once a week. iCharts is a web based service for creating charts used in web sites. Data can be loaded fro Excel spreadsheets, Google docs and by live connection to a database via an API. Charts are highly interactive with pop-ups, zoom and pan and show/hide options. Collaboriative features mean charts can be shared and hi-res images can be downloaded for inclusion into applications such as PowerPoint or PDF files. A free account is available for those who want to try the service. infogr.am – is a free web based visualization tool with 30+ chart types and the ability to download charts as png or pdf files, or embed graphics into web sites. Jolicharts – one of the best known free (with limitations) web based charting tools. Paid for plans for more data storage and data sources. Sophisticated product with support for custom queries, filters and time series. Leftronic – connects to various popular data sources (Google, salesForce, Twitter, Facebook etc) and graphic tools to create powerful dashboards. plotly is a web based collaborative data analysis and graphing tool – in their own words. It goes way beyond many of the simple graphing libraries and online services to support mathematical and statistical analysis in a collaborative environment. A rich collection of graphing types is supported, most of which can support various analytical methods to display analysis. Dashboards are also supported and the analytical functionality means they have been used widely in finance, engineering and science. MicroStrategy Analytics Desktop is a free application for data analysis and visualisation. It is downloaded and installed on a PC and provides access to data in various formats including CSV, Excel, text file and database. A wide variety of visualisations are available (including graphs, heat maps, network diagrams, maps and image layouts) and resulting dashboards and datasets can be shared via an interactive PDF.